Last year I posted a number of resources that could help you and your students explore that age-old question–“Why do leaves turn color?” While on a “nature walk” with my 6 month old granddaughter, last week I was reminded again as we observed a number of early turning leaves. 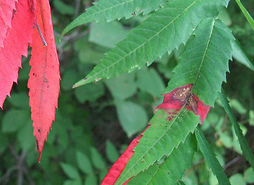 Almost all of the bright red leaves we observed on this walk were associated with some form of tissue damage. Note the leaf tissue damage in image above. When hole leafs were affected there generally was some evidence of stem or pedicel damage. p.s. 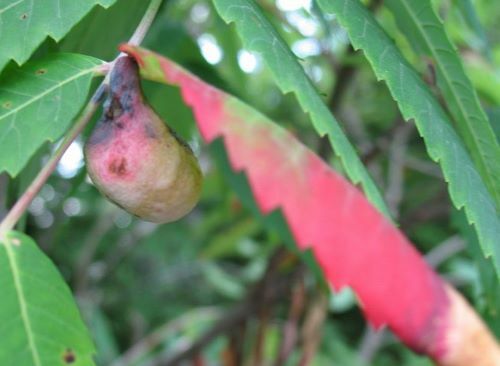 Sumac galls themselves are interesting and a potential question for investigation. They are caused by aphids cut one open and take a look.